Every year visitors to Sandestin find themselves enthralled by the community’s lively beach town charm, so much so that the area soon becomes a second, or even primary, home for many. The allure of Sandestin perhaps starts with its prime location in the panhandle of Florida. Located on a strip of land along Highway 98 between the Choctawhatchee Bay and the Gulf of Mexico, Sandestin is a year-round paradise. The idyllic weather that never seems to fade no matter what season it is enables home owners to get out and enjoy life all year long. The beautiful weather and rolling terrain with natural water and sand hazards makes this community a golfer’s delight. Sandestin is home to a number of renowned golf courses, including the Baytowne, Burnt Pine, Raven and The links golf clubs. The Raven Golf Club, in particular, has been hailed Gold Digest as one of the top places to play in 2000, 2004, 2006 and 2008. If an afternoon out on the links doesn’t sound rigorous enough, Sandestin is also home to a number of world-class tennis facilities where home owners can find friendly competition and a great workout. The Sandestin Tennis Center is one such facility that features 15 clay and hard court surfaces as well as lessons and clinics with professionals to help players amp up their skills. Perhaps the most beautiful parts of Sandestin are the sugary white beaches that are known to the South Walton Region. The Sandestin Golf and Beach resort allows area residents and guests to get the very best out of their pristine beaches by offering various services such as lively beach bonfires and cabana rentals. Never a community to deny its residents rousing activity, Sandestin also offers a number of opportunities to rent kayaks, Yolo boards, and beach volleyball courts for some high-octane fun. At the heart and soul of Sandestin is the Village of Baytowne Wharf, a charming village where residents can experience the finer things in life. The wharfside village is home to South Walton’s only marina, making it an ideal location or seafarers. The Baytowne Marina is a full-service, 113-slip dock that can accommodate vessels of up to 140 feet. Those who don’t have a boat to call their own can charter a number of expeditions from the marina including deep sea fishing, pontoon cruises, dinner dance events, and even wave runner and paddle boarding. In town, home owners will find wide range of activities and events to keep them busy and involved with the welcoming community. The village is home to more than 30 shops and specialty boutiques where shoppers can find everything from resort wear to unique art and accessories. There are also a number of food establishments, sure to satisfy any appetite. In such a laid-back, fun- loving atmosphere, community events abound. 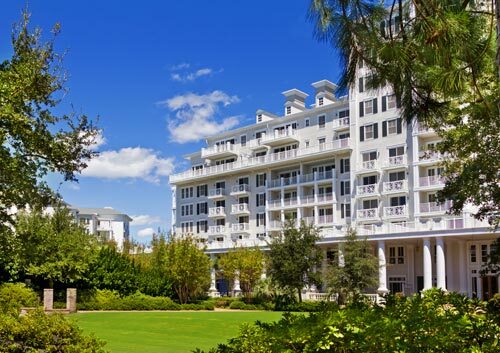 Sandestin plays host to a number of world class events throughout the year.